As time goes by, skin can lose the healthy glow of youth. Sun exposure, stress and the natural aging process can lead to sun spots, fine lines and loss of luminosity. Now, at Refine MD, reverse the effects of time with Halo laser. Other lasers can’t do what Halo can. They are too shallow in their effects, or too deep. Halo is different. With the skilled guidance of the aesthetic medical professionals at Refine MD, Halo targets the right depth, restoring the healthy, luminous glow of youth. Because everyone’s skin is different, for best results Halo should be customized by a skilled aesthetic clinician. 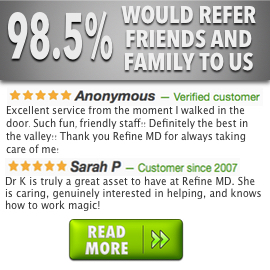 At Refine MD, our aesthetic medical practitioners create a treatment that is customized to your lifestyle. From light treatments that create smooth, vibrant skin that’s ready for makeup the next day, to more intense treatments that restore a youthful glow in just a few day’s downtime, at Refine MD we help our clients reach their aesthetic goals. Halo is unique and effective, and Refine MD is committed to making it easy and successful. We are here to help you achieve your goals for a fun, healthy, happy and beautiful lifestyle. For additional general information about Halo, read Halo Frequently Asked Questions. To find out specifically how Halo can help you reach your goals, schedule a complimentary consultation with our experts today.